I’ll admit, I came a little late to the Guadalupe bandwagon. Between being raised in a fairly traditional Irish Catholic environment and not having a strong personal devotion to Mary, I never paid much attention to this particular devotion or the feast we celebrate today. But the more I learn, the more I realize this is a devotion I can really get behind. The beauty of most of our religious ideas is that they have multiplicities of meaning. What a devotion means to people doesn’t have to be uniform. That’s why I can say that the Virgin of Guadalupe tells me that the Church can change. Rather than being one of the European porcelain Madonnas, she looks like the people to whom she appeared. She brings together the occupied and the occupiers in her very flesh, manifesting the union of European and Native cultures that has both enhanced and tortured the Americas since the “New World” was “discovered”. Even though she appeared nearly 500 years ago, she speaks to me of newness, that the church is not a relic but a living, changing entity, and she gives me comfort that no matter where we wander, she and her Son are with us. 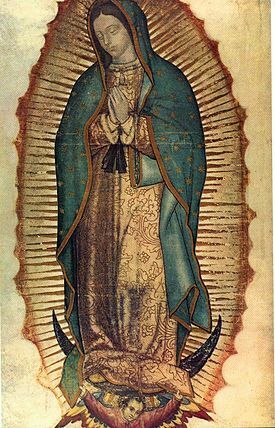 Having been raised in an anabaptist (rebaptiser) tradition, which required that I intentionally embrace Mary through much fear and trembling, I’ve come to adore Our Lady of Guadalupe and her messenger Juan Diego. She was the first apparition that I really investigated. She taught me of the relationship of private revelation and the miraculous to the hierarchy and enduring tradition of the church. She taught me to trust that her whole will and intent is to foster the union of every creature to her son. She taught me to engage her embrace and let her fling me into the inferno of the Trinity! O clemens, o pia, o dulcis virgo Maria! What a beautiful witness to Our Lady! I love your description of her significance in your spirituality. Pope John Paul II greeted Mexicans as “Guadalupanos” for their devotion to her. She was (and is) a symbol of the Mexican Independence. Her face looks more Indian than European. She is the “new” world’s adoption of the old world’s religion, and its evolution into something different, something strong, something proud. Her gentleness, her faith and constancy, her beauty and her love continuously renew in us hope: hope that wrongs can be made right, that dignity can be realized, that roses can bloom in winter. Since I grew up with images of Our Lady of Guadalupe everywhere, she doesn’t feel new, exactly. But on hearing the story of Juan Diego, I saw how she made clear to the faithful of 500 years ago that the Children of God came in all shades and shapes. La Virgen India inspired generations of Mexicans and subsequently Mexican-Americans to faith and to self-identity. Guadalupanos, indeed!